From Invincible Iron Man #28, Matt Fraction and Salvador LaRocca. This begins with I think, therefore I am, the translation of Descartes’ Je pense donc je suis (1637) or the more common cogito ergo sum (1644). 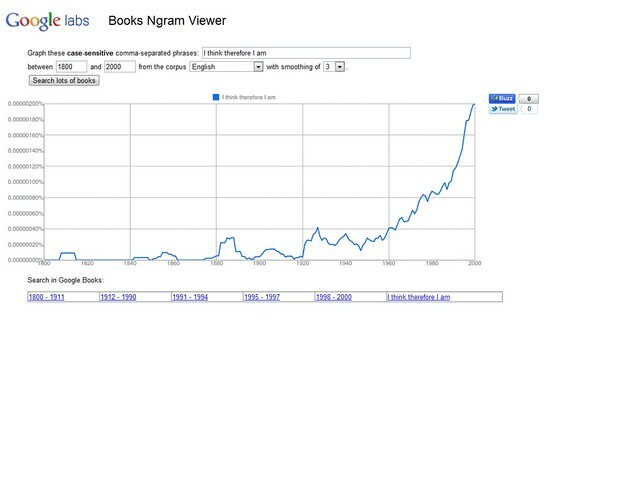 The Google Ngram Viewer reveals “I think therefore I am” taking off in (non-periodical) print around 1900. The snowcloneification was surely not far behind, since so many people would already have been familiar enough with this cliche of philosophy. Something else will very occasionally occur in place of “am” (“I knit, therefore I blog“), but this generally weakens the tie to the original–unless the composer of the snowclone is very clever. X is often single-syllable verbs, no doubt to help evoke the original, but longer words are possible: smell, skate, rez, tweet, drink*, fink*, shrink*, consume. * Note the rhyming with the original think. This snowclone began with the 1999 film Fight Club, whose title is X0. 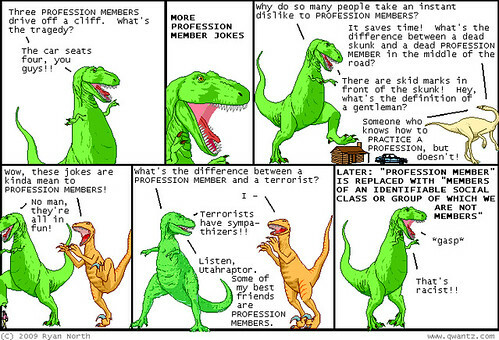 Note that the original phrase was “…you do not talk about fight club”, emphasis mine. 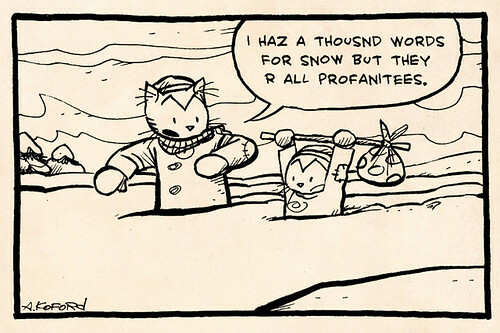 This shifting to the less-formal contracted form is consistent with the reference to the film being a playful one, as snowclones in general so often are. Many of the Xs are also clubs, including fat club, AppleClub, film club, Lego club. Other Xs include robots, the metro, Usenet. One unusual X, the quilting society, turns out to be in the title of an Onion article. These snowclones often serve as headlines to stories about X, in which it is interesting that participants in X do not talk about it. Her post can be found here, and includes “X is so Y”, “every time X, a Y Zs”, and “X happens”.